Pre-order Lord Foul's Bane by Stephen R. Donaldson now! This is exciting news for me. I'm a child of the '80s. I began my fantasy foray with The Sword of Shannara by Terry Brooks when I was thirteen. At the time, I saw the Del Rey logo on the spine and I went to bookstores looking for similar books by the same publisher. It led me to Anne McCaffrey, Barbara Hambly, David Eddings, and others. But it was my mother who gifted me Lord Foul's Bane, a recommendation from my 8th grade teacher. Thank you, Mr. Millay! If my love for fantasy began with Brooks, it was solidified by Donaldson. Lord Foul's Bane and its sequels hold a dear place in my heart. A dark corner of it, for sure. Thomas Covenant is a writer who has lost his family and livelihood -- and perhaps some part of his soul -- after being diagnosed with leprosy. Whisked into a fantasy land and supposedly its savior, Covenant is unsure if any of it is real or not. I connected with this character in a lot of ways. I had severe eczema growing up and felt very much like an outcast, leper, unclean. Kids can be cruel. And like Covenant, I fell in love with the setting of the novels, the Land. Best of all, Donaldson's ability to weave conflict and beauty through powerful prose has made me a life-long fan. Once Grim Oak Press acquired the rights, I knew I needed an artist who could capture the magic in Lord Foul's Bane, someone I had access to in person. Art direction is important to these books and that's easier one-on-one. I chose Allen Morris, an apprentice of sorts to Todd Lockwood and one helluva artist in his own right. He lives close, making him perfect for the job. The map came next. I wanted to redesign the Land's map while keeping design elements from all previous maps. I hired Isaac Stewart for the job. 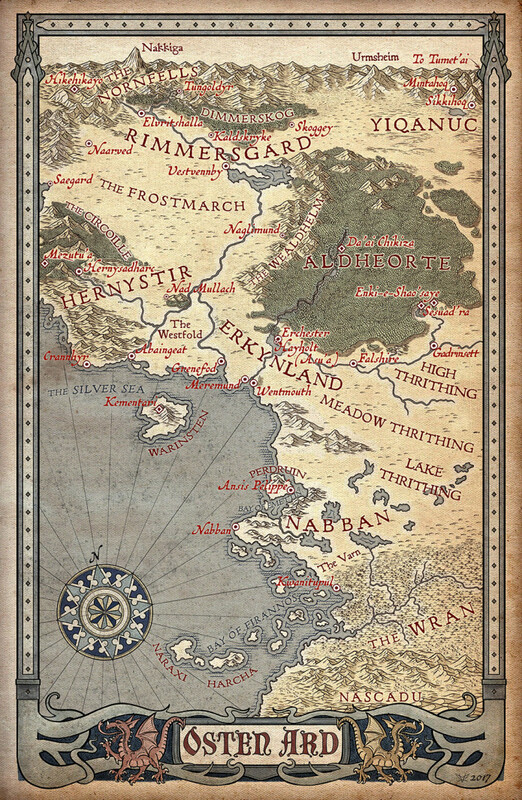 He just finished the Osten Ard map for Tad Williams and it's gorgeous. The Land will be given great justice by Isaac. There will be 52 lettered editions and 500 limited editions, both triple-signed by Stephen R. Donaldson, Allen Morris, and Isaac Stewart. Allen Morris will be creating at least 10 interior illustrations for Lord Foul's Bane along with a wrap around cover. The book will be in leather and will have a ribbon. It will be made with the best materials possible. It should ship by March if all goes well and perhaps earlier if we get artwork quicker. And we will match the numbers of the volumes with one another - we will be producing editions of The Illearth War and The Power That Preserves - as they are published so you will have a matching set!. Like the Shannara trilogy that Grim Oak Press is publishing, a lot of love will be going into The Chronicles of Thomas Covenant, Unbeliever. I promise you that. If you have any questions, feel free to contact me. I'm always available! Are you saying the Lettered Edition is calligraphic? Inquiring Haruchai librarians want to know. When is this scheduled to be published? I am trying to order a copy of the lettered edition of Lord Foul’s Bane , one of my favorite fantasy books ever and am unable. When I click on the link I get page not found. Please help! I devoured these books 25 years ago! Thank you. Ordered the lettered edition: Very excited to finally have the Thomas Covenant books receiving the limited edition(s) treatment. Hi Shawn, am having trouble updating my account and am chomping at the bit to secure my copy of Lord Foul’s Bane. Please help! Don’t want to miss out on getting a nice edition of my absolutely favorite fantasy series. Excellent! Thrilled to see this happening. My order for lettered edition already placed (and maybe letter “C” to match the other Grim Oak Press lettered editions I have?). Really looking forward to this as this was my favorite fantasy series of all time (SciFi series remains Asimov’s Foundation series).